During the next few days we have the chance to observed the “Dance of the Planets” in the early western sky. In this image, you can see three “stars”. 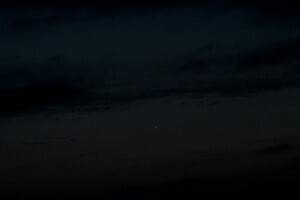 The top left is Jupiter, the bottom is Venus, and the right is Mercury. 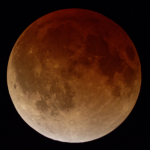 Tonight’s weather didn’t allow for any spectacular images, but I’m hoping that the next few nights may be clear. 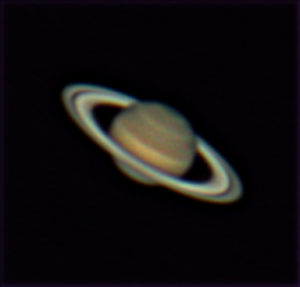 Tomorrow night, the planets may even be close enough to fit into the objective with my camera in prime focus with my telescope. 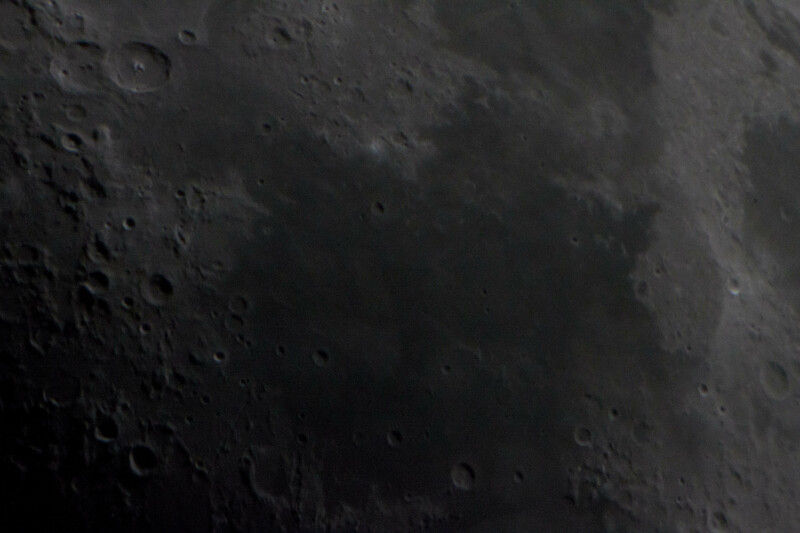 Tonight was the first night without clouds since I got my new wedge. Unfortunately, the visibility was low, the humidity high, and the wind too strong to take any long exposures. 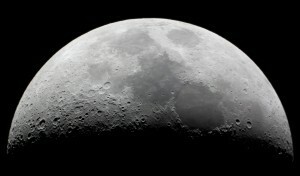 I did finally take a shot of the moon though. 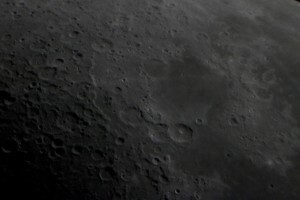 Here are two shots I took with my barlow lens to get some extra magnification. 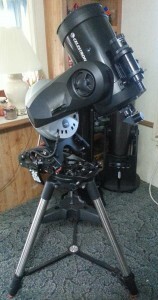 The barlow doubles magnification at the cost of brightness, this is why I had to change the exposure and iso, resulting in a little more noise than usual. 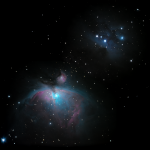 Technique: 28 lights (30 seconds at 1600 ISO), 20 darks, 20 flats, 50 biases. Prime focus. Manually stacked and post-processed with Photoshop. 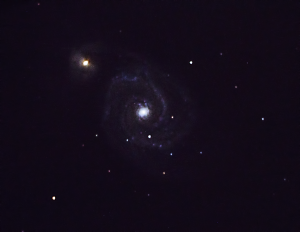 This attempt at M51 proved to be much better than my first. After reducing my ISO, increasing my exposure time (probably a bad idea), and increasing my frame count, I was able to capture much more light with much less noise. I’m glad I was able to keep much of the color this time. 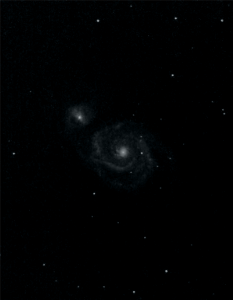 DSS still did not want to stack my frames, again probably due to my mount so I had to manually stack them with Photoshop. I’m glad I was able to “save” these frames. Technique: 30 seconds at 1600 ISO in Prime focus. Before spending the evening on a second attempt at the Whirlpool Galaxy, I took this quick photo of M5. Technique: 3 lights (25 seconds at 6400 ISO), 10 darks, 15 flats, 50 biases. Prime focus. Stacked with DeepSkyStacker and post-processed with Photoshop. Here is my first successful attempt at stacking. 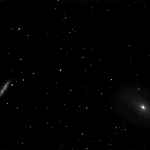 I took 10 exposures, but DSS was only able to stack 3 of them. 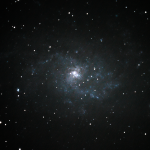 I believe this is due to the amount of noise in the image and the fact that I’m using an altazimuth mount to track. I had to do a lot of post-processing to bring out the detail in the arms and get rid of the noise. Unfortunately, this cost me any color I had captured. 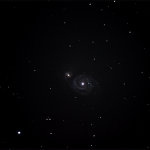 Still, considering it is over 23 million light years away, I think this a great first attempt at my favorite galaxy! Technique: 25 second exposure at 6400 ISO in prime focus. 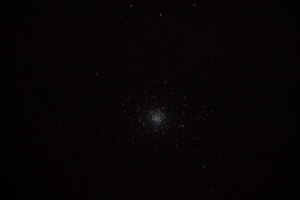 After some failed attempts at M101 and M42, I was able to catch a glimpse of the globular cluster M5 in Serpens.